Are you looking for music activities for your young child? Look no further because the following story is fantastic for introducing your child to the musical instruments and the possibility of playing one! However, you may find that as an adult you will be equally interested in the next story! Meet Max, the musical hippo! Let me me introduce you to Max! If you are looking for musical activities for your kids, you would like to meet him! He is a hippo! He loves music and practices many different instruments. Max’s mom is very proud of her son’s musical interests. Unfortunately, Max goes through a bit of trouble with his neighbors who see his music as “noise.” It takes some time until Max’s surroundings find appreciation for what he does. It also takes some time for Max to re-gain his inspiration and continue practicing. While reading or watching this story on DVD, you may find yourself giggling, dancing and moving with the beat of the music. While doing that, your child will be getting exposed to the different musical instruments. If your child is already taking lessons, watching Max’s excitement about practicing his instruments will help your child’s enthusiasm for practicing their own! I think this story about Max offers much more than just introducing the different musical instruments to a child. It can teach both parents and students a lot about music, family support and environment. The reason I began writing that adults may like it too is because the story offers valuable lessons to parents as well. Max’ enthusiasm to practice his instruments is influenced by his environment and that to me is the greatest moral of this story. A parent must always take into consideration the environment in which their child is learning. I am at home alone on a Saturday night as I am writing this post. And what I am doing is…giggling and laughing with a children’s music story…yes that’s right! I am reviewing children’s books and looking at DVDs for a school presentation we have. My 8th grade students will be going to present to a preschool program at a different district. We will be playing for 5 year- old children. We want to expose them to the different musical instruments. We also want to introduce children’s music books to them and combine literacy with our music presentation. I don’t know if spending my Saturday night thinking about that is a sign of passion or madness. I will let the readers decide. However, I am convinced that you may do the same if you saw this DVD or read the book! It is a great educational material but at the same time it is very amusing, vibrant, and moving! You can find the story about Max on a DVD, Audio, or a book. All of them can be valuable as they would provide different ways to expose your child to music. If reading with your child is your regular activity, then adding this book will be a great addition to the time spent reading with your child. If your child enjoys watching TV, then using the DVD will be fantastic, as they will also be watching something with great educational purpose. To me the DVD is better for this particular story because your child will be able to read on screen and enjoy the wonderful music at the same time. If you feel that you would like your child to enjoy other stories that complement the story of Max, then consider Scholastic’s Young Artist Collection as a way to add to your child’ music activities. This is a selection of 17 stories, including that of Max. All stories have an option of reading on screen. The stories complement each other as they are themed around music, building confidence and character. They are a great educational tool and and a great way to expose young children to music and music activities. Why are these stories going to become a gem in your educational material library? These days every parent has to fight the media battle. No matter how much we want our child to be engaged in learning, TV gets on the way! This is an inevitable consequence of our society which our children sometimes pay a price for. However, you can use this to your advantage by choosing quality programs where your child will be “entertained” while at the same time reading on screen and learning about the world through the DVDs. There are many parents who ask me about ideas to expose their child to music. I would like to introduce and share ideas that parents can take advantage of and use with success. My goal for this post is to provide a musical activity for your child that you can use right away and with instant success. Intellectually motivated by combining disciplines (music and literacy) in a fun way. However, the ideas in these educational materials leave room for more discussion. This is why the story of Max will only be the introduction to a series of posts exploring family environment and the way children learn about music. This website is providing the different articles in this blog. Thanks a lot for providing the nice info in this blog. Children Educational Books. Thank you for visiting the blog and for your comment! I am a Suzuki Violin Instructor myself and lots of the articles in the blog are geared toward Suzuki violin lessons. I hope the site is helpful for you and your children! My son adores books with characters named Max 🙂 Go figure, huh? He will especially love a musical Max. Thank you so much for linking this one in! Thank you for your comment. Have fun exploring the musical Max. Musical Max looks like a great read! I love children's books that encourage kids to explore music. Thanks for co-hosting the Kid Lit Blog Hop with us this week! Max looks so enthusiastic! I am sure I could use his enthusiasm at home 🙂 DD loves to play her piano but there are days when I could use Max's helping hand! Yes, Max is enthusiastic. The DVD suggested has 5/6 stories all on musical themes and they are all very helpful in engaging kids and working on their enthusiasm for music and the arts. The Cover of "Musical Max" is great! Thanks for sharing on the Kid Lit Blog Hop! 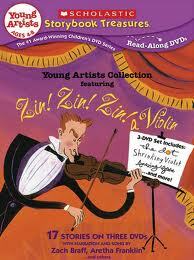 Oh, my kids and I love Zin, Zin, Zin a Violin. Musical Max sounds so adorable as well. Thank you for your book recommendation and thank you so much for joining us as co-hostess on the Kid Lit Blog Hop this week.